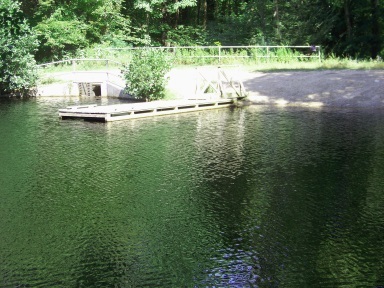 The Holly Pond Trail is another of the lesser used trails, known mostly by campers and others who use Wompatuck State Park regularly for outdoor recreation. 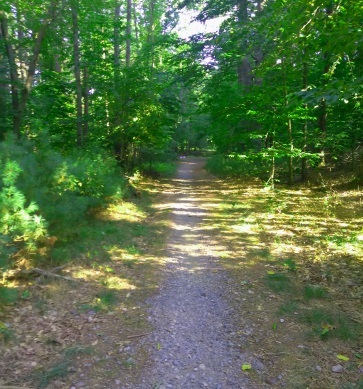 If you are camping at Wompatuck State Park you will find the beginning of this trail past the campground road marked "W". 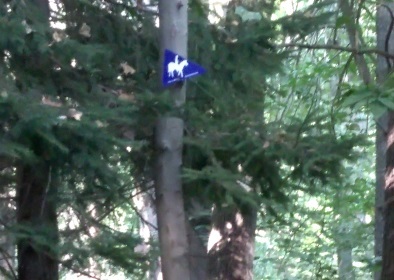 The trail marker is S17. 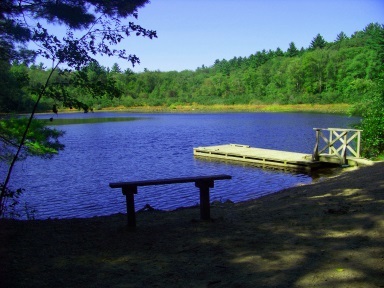 If you are not camping at Wompatuck, park near the ranger station or the transfer station just across the street. Another parking spot would be at the Mt. Blue Spring parking area. If open you may obtain a map of the campground at the Ranger Station, this may be helpful navigating that area. 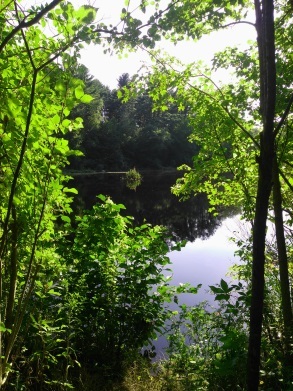 An explore of the campground alone can be a several hour adventure! Much of the non electric side is not in use. In season this bath house is a handy resource. Follow the main entrance road in taking a left to the non electric side of the campground. If you park at the transfer station there is a more direct way in across from the park marker "E14". This leads directly into the campground just shortly before the Yarrow Bath House. The main road takes a right and follows past the Bath House. Hiking mileage starts here. Once after the bathhouse follow straight. There will be a multi use trail leading straight into the forest. This leads to the marker S18 which is an alternate route. 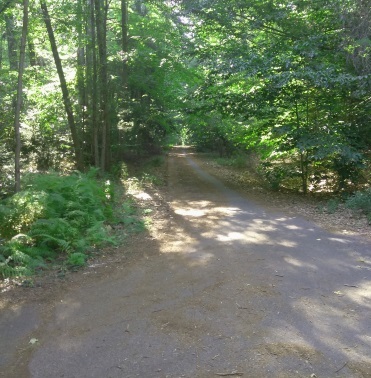 To find S17 and the Holly Pond Trail however, take a right with the main road. This will lead you on a portion of "R" road and then a left at the next intersection. The road continuing straight here is marked W road??? These are not used anymore and not marked. Head straight till the main road turns right. Another unmarked road to the right. Shortly after the road turns right, the trail leads left on a trail that begins with asphalt at .22miles. Turn and look across from this intersection and you should find the S17 marker. If you have parked at the Mount Blue Spring lot, find the narrow trail beyond the fence to the right of the parking area. It starts midway up the parking area and climbs a moderately steep hill and brings you into the campground on the "Y" loop. 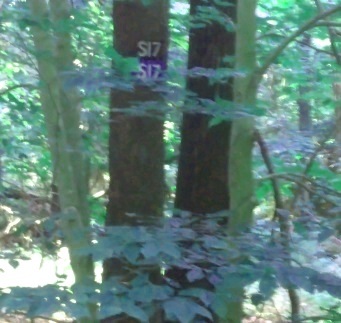 At the top you will find a "W7"marker. Once in the campground go left and follow the loop road out to the main road and go left again. You will be just past the bath house, follow the instructions above to access S17. This route seems to be a favorite of many a bicyclist especially to connect to the South Area where a well travelled bicycle loop exists. The Holly Pond Tstarts wide and asphalt changing quickly to gravel. Careful as the asphalt has a bit of a lip to it as it changes. 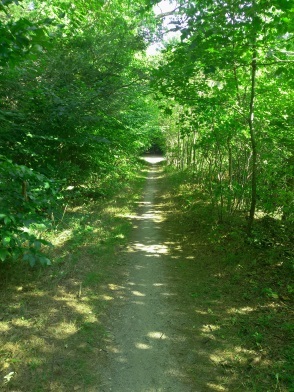 The Holly Pond Trail then runs a steady light downhill grade. The park suggests this for equestrian use as well! but certainly is wide enough for this kind of use! The trail turns sharply to the right as it comes to the intersection at .28 with a couple of trails one leading to the border of a closed off area. The alternate S18 trail goes left here. The hiking trail will go up hill slightly after the turn and you may encounter a sign warning of hunting in the area. The trail will now go downhill at a much steeper pace. 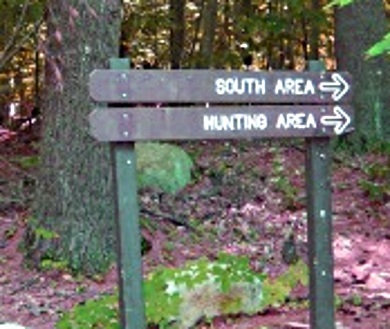 A trail not on the map leads to the right with another hunting sign at its entrance. right with first views of Holly Pond. but still wide enough to support multi sport activity. 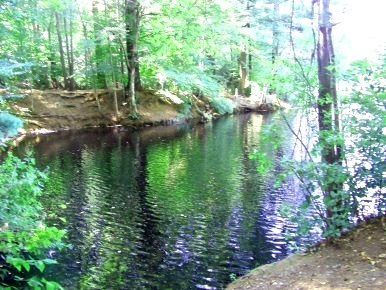 area as a place to fish. the end of the destination. Not sure what or how much of a stock is here. If you continue straight you will come upon a paved road with an open gate. Here are the markers S15 at .51 and S16 around the corner to the left. Before this gate is another trail leading to the right. 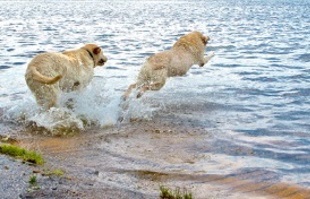 This lagoon area is used often as well for dog swimming. Great for dogs that are not as social as some may be. 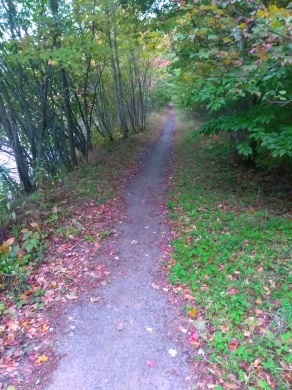 The alternate "beach" is on this side trail. 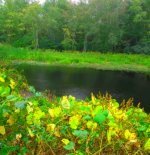 It follows the pond shoreline. Another view from the side trail after the beach. Following the road through the gate and heading to the left will bring you out to Union St, the main road through the park. A loop can be made by going left on Union St and continuing on to the parking at the Spring or at the Campground. 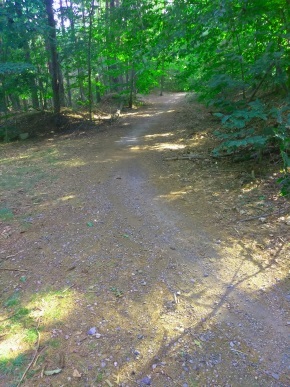 There are many other trails and loops going right at the paved road after Holly Pond Trail. The main paved road will make a loop around the wildlife management area. This description is good as an additional way after the Picture Pond Loop or for those coming to the park to directly visit Holly Pond. This sign is located on Union St. There is a gate here blocking vehicle access. a good idea. This is used as access for Scout camping. 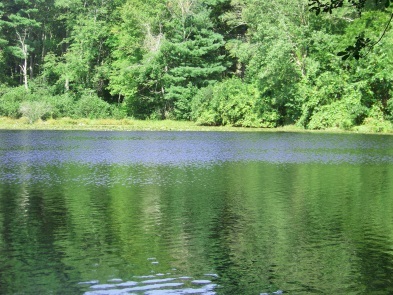 From the back gate in Norwell and the Picture Pond Loop trail head continue down Union St. 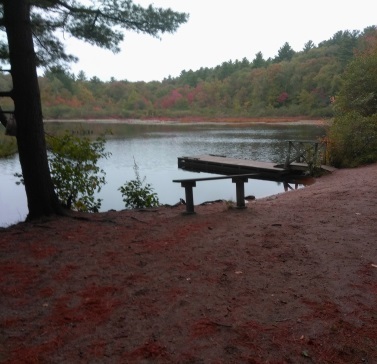 Shortly you will pass by a couple trails into the South Area on the left and Boundary Pond. After the pond there will be a couple more trails to the left and the road will start a moderate downhill jog. The hunting area sign and gate will be at .23 miles. Follow the wide paved road till you find the S15 marker and the wide gravel road it marks. Along the way at .34 a trail leads left uphill and across to the right will be a short overlook to the Aaron River. At .42 will be a left for S35 multi use trail. S16 will be to the left at .51, strangely the marker is before the trail. A short distance later at .55 you will come to S15 and Holly Pond will be in sight. 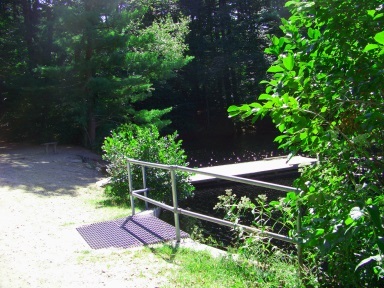 Continue straight over the culvert to access the trail that leads to the campground. At .68 you will pass through a chain link fence gate area. The trail will start a moderate uphill climb. To the right just before another chain link fence a trail leads out. This connects to one of the S19 boardwalk trails off Union St.
At .80 the hill crests and the trail meets an intersection. The trail straight connects with a S18 trail marker. The Holly Pond Trail goes left here. The trail continues uphill but more gentle and shorter. At .87 a wide road goes to the left into an older campsite. The trail continues straight through a stone wall. After the stone wall the trail turns to asphalt. The intersection at S17 and the Holly Pond Trail head. This shows an older unused camp road. It arrives at the camp road and S17 marker at .90. Go right, shortly another campground road goes left and at .97 the trail meets the junction of R & W roads. Go right, you will start to see occupied campsites in season. 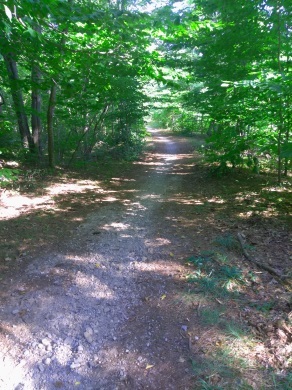 At 1.05 the trail meets a main camp road with a wide multi purpose trail to the right that leads to S18. 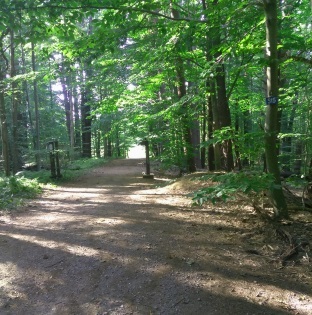 Going left will bring you to the bathhouse and Yarrow Road on the right where you will find marker W7 on the left and the trail to Mount Blue Spring parking lot across from the marker. Follow Union St down to the campground or across the street at the transfer station or further down Union St at Mt Blue Spring. All have abundant parking. If parking at the back gate directions for Mt. Blue St are here. Scroll down for this entrance. The trail is only 1/2 mile. Good connector for many other hiking routes. 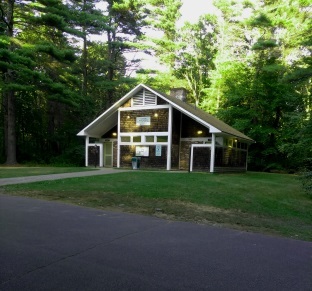 There is a link to a map on the Wompatuck State Park main page. Maprika is highly recommended because of the abundance of trails and used with a smart phone becomes a gps as well, much like google maps with a vehicle!